The Leading Guide to Guest and Resort, Fly-Fishing, and Cross-Country Skiing Ranches in the United States and Canada, 6th Edition. Never mind that our winter season hasn’t been as snowy and miserable as it was last year. That doesn’t mean you still couldn’t use some fun in the sun and time to stop and smell the desert wildflowers. It’s easy to get away for a last-minute vacation at a warm, sunny Arizona dude ranch resort vacation. Can’t you just picture yourself saddled up at your guest ranch resort and riding through a spectacular show of blooms–or just hanging out by the pool and working some color back into your skin? When to go? Timing the wildflower season in the Southern Arizona and Tucson dude ranch region is tricky–those darn flowers are as unpredictable as the rainfall. Anytime from February through May, is peak season for everything from purple swaths of sand verbena to red, yellow, and white cactus flowers. And when you do get a great wildflower display in the desert, it can be awe-inspiring. The resort was recently chosen as one of Arizona’s best by Golf Weekly. Weintraub notes, “If a golf escape is what you’re looking for, our ‘Golf Getaway’ has everything you need. Play the award-winning Los Caballeros Golf Club and stay at The Ranch for a visit full of long drives, low scores, and resort-scale amenities.” Call 800/684-5030 or e-mail reservations@sunc.com for more info or to make reservations. If you’re seeking a luxe hideaway, Hidden Meadow Ranch near Greer boasts an elegant log main house and 12 luxury log cabins. Their Valentine’s Day package is a pip, with a 2-night stay in a 900-square-foot private, luxuriously furnished log cabin. “Our getaway includes all your gourmet meals in front of a crackling fire in our beautiful Ranch House plus, on one night, a champagne toast before dinner followed by our “Two Hearts Eat as One” special dessert selections, a complimentary rose petal and chocolate heart truffle turndown, and a CD of romantic music to play and keep. You can also decorate a handmade Valentine’s sugar cookie for your sweet sugar!” Sweet. Book soon; since Valentine’s Day is on Tuesday, February 14th, this package is available from Friday, February 10th, through Tuesday, February 14th. 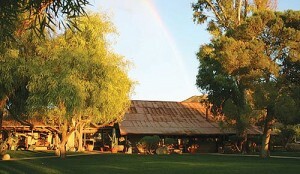 Both White Stallion Ranch and Tanque Verde Ranch outside Tucson have stellar reputations as resorts with lots of variety in family friendly amusements: nature walks, swimming, gourmet cuisine, along with the kind of classic southwestern design and décor that many clients come for. At White Stallion Ranch, act fast and you can join the Dawson Bridge Vacation (February 6 thru February 10, 2012) and brush up on your card-playing skills (cost: $1,050 per person double occupancy, $1,321 single; includes tax and service charge; Does Not include riding). Call 888-977-2624. And at Tanque Verde, you can swing a racket or swing into the luxe little spa. 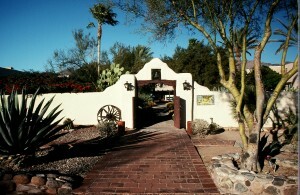 Check out Tanque Verde’s ‘Last Minute Vacancies’ for special rates for accommodations that are ready and waiting. Or try the ‘Back in the Saddle’ package (available| January 10 – February 29); Book 3 nights, get the 4th night free (Valid for stays taking place through March 4, 2012 ); 25% savings with rates starting at $225 per person/night. You get deluxe lodging, 3 daily meals, daily activities. Ahhh! Take me away. At the recent Dude Ranchers’ Association Annual Convention in Cody, Wyoming, one of the keynote speakers was Nancy Schretter (at left), Managing Editor of The Family Travel Network. That’s the award-winning family travel site featured on the The Today Show, CNN, America Online, Parents Magazine and in USA Today. Ranchweb’s own Gene Kilgore attended the conference and was impressed with Schretter’s talk. “It was upbeat and positive,” says Kilgore, “ explaining how much guest ranches have to offer to families and how guest ranch owners can position a ranch vacation as a multisport family travel outlet.” So we set out to learn more about Schretter and her online Family Travel Network (FTN). Launched in 1995, FTN serves readers as an’ unbiased source of family travel advice, reviews, bargains, and articles by travel industry experts’. According to the website, FTN is the nation’s ‘oldest and most comprehensive free online site devoted exclusively to family travel and planning great vacations with kids’. Based in McLean, VA, FTN is produced by Beacon Interactive, a division of The Beacon Group, Inc.
FTN’s Managing Editor, Nancy Schretter, is an award-winning travel journalist and editor, mom, and a busy gal. But in between deadlines, we pinned Schretter down for a brief chat with her to talk about how she got into the world of family travel, how dude ranches can work best in a families’ vacation plans, and how ranchers can work smarter to appeal to families. Ranchweb: How did you get started with FTN? Schretter: The Beacon Group (parent company of the Family Travel Network) was publishing newsletters in 1995 and we saw the need for more information on family and multi-generational travel. America Online (AOL) came to us to talk about partnering to take some of our other newsletters online. I told AOL about the family travel newsletter and they suggested that we do it online with them. It turned out to be a winning combination—we launched and grew with AOL, reaching hundreds of thousands of families. Eventually, we moved out onto the Internet where our content can be seen by everyone. Ranchweb: How is FTN’s coverage different from other travel sites? Schretter: The Family Travel Network is an independent, award-winning online travel magazine providing unbiased coverage of family travel destinations and lodging options. The site provides extensive firsthand destination information and city guides; detailed reviews of resorts, cruises and lodging options; lots of family trip planning advice; a wide variety of vacation ideas; “been there-done that” family travel tips; money-saving hot deals; and more. We do not sell travel of any kind, so we can cover whatever we think is best with no hidden agendas. Our articles are written by seasoned family travel journalists and travel industry experts who are also moms and dads who travel extensively with their own families. Our coverage is widespread, so we have information on great family places that are around the corner or across the globe. Ranchweb: We heard you’ve taken a ranch vacation in New York. What did you love most about your dude ranch trip? Schretter: Our family loved the horses, the outdoors, and all of the cool things there were to do. My kids and I were very into horses and animals, so that was a huge attraction. There were lots of activities that we could do as a family, which made for great memories and bonding experiences. In addition to all of the horseback and pony rides, there were sports activities, water fun, kids programs and lots of evening activities, too. The kids liked the sing-alongs. We packed a ton of fun into our short time there. The fact that it was all-inclusive was also a big plus. Ranchweb: How can the dude ranching industry (and ranches specifically) work harder to get its message out to the world of family travel – especially to moms? Schretter: Picking the right ranch can be a confusing process, and Moms are always stressed for time when searching for the perfect family vacation. That’s why I love Ranchweb. It’s a great informational resource for families. Ranchweb cuts through all the Internet clutter and helps parents find the perfect match between their family’s need and interests and what individual ranches offer. That’s a real time saver! When I started looking into ranches, I was blown away by the number and types of ranch experiences that are available for families. There are so many different options, and there’s definitely a ranch to suit almost every type of family. There’s no one “set” ranch experience, so it’s important to get rid of any preconceived notions. Parents need to understand that there are also so many different things that families can do on a ranch. It’s more like a multi-sport vacation: you can do horseback riding, hiking, fly fishing, rafting, swimming, mountain biking, and so much more. It’s impossible to get bored! Moms need to hear how well a ranch vacation works for all ages – from younger children, ‘tweens and teens all the way up to grandparents. Ranches need to get their message out to everywhere moms are: online, via social media, print, and broadcast. It’s also important to hear the message from moms who have taken ranch vacations so they can get firsthand information and an accurate feel for all the activities and what makes ranches so great for families. I also think that people need to understand how great the owners and staff are. That’s definitely a big part of the ranch vacation appeal. It’s families catering to families, and that makes it very special. Ranchweb: Thanks, Nancy! We hope moms who follow the Family Travel Network will try Ranchweb to help them in their search for the perfect ranch vacation. And we’ll make sure to ask our readers to take a gander at The Family Travel Network. Moms are often the ones who end up doing the background research for any vacation. That’s especially true when they’re hunting for a dude or guest ranch vacation for the family. Any mom would agree: it’s always good to start your selection process early. But even August isn’t too late-ask about cancellations. (In fact, you can find some great last-minute bargains even in dude ranching’s high season– see item below). Begin asking friends and family if they’ve been to a good dude ranch (posting a query on Facebook is guarenteed to garner some good ideas). Then, on the Internet, start with sites that narrow the search (like Ranchweb, the Dude Ranchers Association, and state tourism sites). 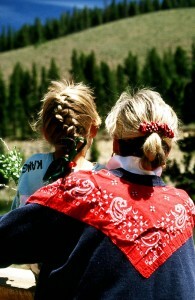 Query ‘last minute deals’ or click over to thhe site’s deals section (like http://www.ranchweb.com/special.htm). Then work the phones. When you’ve selected your top choice ranches, ask each for a list of past guests that wouldn’t mind a call from you (that is, guests who came with kids). Then call and ask if they have time for a few questions about their ranch stay: how child-oriented they felt the ranch was; what kinds of kid-programs they participated in and what ages the programs worked best for; what their kids really loved (or not) about the ranch. Finally, ask if you can get a short taste of ranch life for you and your family. Most ranches request that you stay at least a week, but some kid-friendly ranches, like California’s Rankin Ranch, allow stays as short as one night. 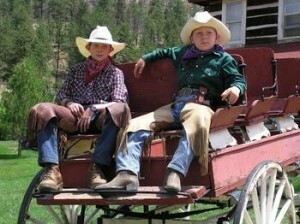 See if there’s anything out-of-the-ordinary the parents suggest you should bring for the kids when they visit a ranch. You might get some surprising answers. And if your “little dudes” have any special considerations, mention them; if their children share those considerations, you’ll find out how the ranch accommodated them. You’re sure to get some great ideas from the vast—and helpful—network of parents out there. And you might even make a new phone friend. Details: great ranches for kids are easy to find on the Ranchweb site. Go to the category ‘selecting a ranch’, then click on ‘for kids’. In beautiful British Columbia, Echo Valley Ranch and Spa is calling all ‘wannabe’ cowgirls. If you’ve ever wanted to ride the range and throw a lasso, yet still like a little luxury at the end of the day, then the Echo Valley Ranch girls getaway is a vacation to think about. Start your day with an early morning Thai yoga class, then saddle up and ride the golden hills of British Columbia’s eastern side, taking a break to enjoy one of chef’s gourmet picnic lunches. At the end of the day, you can restore your mind and body with an Asian or European spa treatment, then watch the sun go down. Priced per night from $605, this vacation isn’t for budget-minded gals, but it can include: One half day horseback ride and wilderness picnic; One signature Western or Asian spa treatment during the stay; Group manicure/pedicure; Lasso throwing lessons from the local cowboys; Self guided hiking program; Daily Thai yoga (Ruesri dat ton ) stretching classes, and more. Right now is the right time to find great bargains in dude and guest ranch vacation. 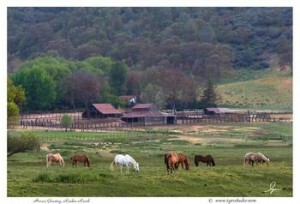 Take California’s Rankin Ranch, offering a 50% Discount: Rest and Relaxation Week October 2nd-5th. Or Colorado’s Laramie River Ranch: : 30% Discount for Adults Only Special in September! 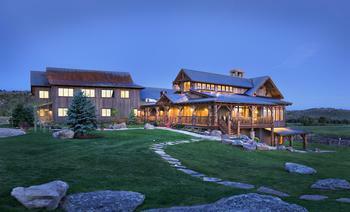 The Lodge and Spa at Brush Creek Ranch has Home on The Range Summer Package. Colorado’s Elk Ranch has ‘the more the merrier’ 15% discount (check details); Wyoming’s 7D Ranch has 10 % discount weeks in September (adults only). Can you think of a more All-American activity to attend this July 4th weekend than a true Western rodeo? We can’t. Going to a Western rodeo is like taking a mini-vacation to another country. Heck, it’s like another world, where iPods and Blackberries haven’t been invented yet and the only communication skills that matter are how a rider communicates with his horse. But if you think a rodeo is totally about buckin’ broncs, you are wrongamundo. There are activities for moms and kids, too, often including stylish horse shows, parades, children’s petting zoo areas, and places where city kids can learn about real farm animals and see pretty ponies. And of course, you’re likely to see some pretty cowboys and cowgirls, too, all decked out in their fanciest duds, widest-brimmed hats, and belt buckles the size of dinner plates. Luckily, the Ranchweb.com home page has a button to click to help you find a rodeo near you. They are everywhere. There are some 100 events listed in July alone. You’ll find biggies like the Cheyenne, Wyoming’s, Frontier Days and Salt Lake City’s Days of 47, to smaller events like Jacksonville, Texas’ Tops in Texas event. This month, stampedes are big. Nampa, Idaho has the Snake River Stampede; Elgin Oregon has the Elgin Stampede; Nevada has the Silver State Stampede in Elko; and Mitchell, South Dakota, has the Corn Palace Stampede (I’ve been to the Corn Palace and its exterior is all covered in murals created out of corn–amazing!). One of the oldest is Cheyenne’s Frontier Days. Frontier Days is a world-famous annual celebration of the American West featuring the ‘Daddy of ’em All,’ the largest outdoor rodeo in America. I covered the rodeo a few years back and was amused to find that even the media is required to ‘dress the part’ when covering the rodeo. My photographer and I were required to wear western shirts and western hats, boots, and jeans. I loved it (and I still wear that hat). Details: This year, the 114th edition of the “Daddy of ‘em All” returns on Friday, July 23 and all the rodeo action begins the next day. There’s a host of satellite events from downtown parades to “Frontier Nights” evening concerts to free pancake breakfasts. – The action draws cowboys and rodeo and music fans from throughout the country for a spirited, ten-day celebration of Western heritage. Nine days of rodeos sanctioned by the Professional Rodeo Cowboys Association (PRCA) will run from Saturday, July 24, through CFD’s conclusion on Sunday, August 1. Pre-show events begin at 12 noon; rodeos begin at 12:45 p.m. Nearly 1,500 contestants will be vying for a share of the more than $1 million in money and prizes, plus the prestige that comes from winning America’s best known rodeo. Like so many rodeos, Frontier Days unites the community and serves as an important boost to Cheyenne’s economy. Across the rural West, smaller rodeos play their own part in boosting their local economies. And just as important, rodeos play a role in keeping a part of our Western culture alive. So relive a little bit of our Western heritage this July, and go out to a rodeo near you. And if you can’t make one this month, not to worry, they spread across the calendar, and across the map. You’ll find them in cities like San Francisco (the Grand National Rodeo, Horse and Stock Show and Junior Grand National Stock Show to be held October 14-23, 2011) and Denver’s National Western Stock Show. At Brush Creek Ranch, guests may explore more than 50 miles of spectacular wild country. Choose your adventure: roam by hiking, biking, trail running, horseback riding or angling. Swing into the saddle on guided rides or cattle roundups. You’ll be offered instruction from the best riders around: individual instruction, clinics, and trail rides. Then you can canter across some 13,000 acres and 50 miles of trails or work your horse in the indoor arena. Cast a line into the North Platte, or challenge the private waters on Brush Creek Ranch, and you’ll be assured of an unforgettable fly fishing experience. Choose waders or drift boat, or start out with pond fishing on the ranch (a great spot for beginners). The fly fishing is multi dimensional, from the North Platte River to nine miles of private water and those five stocked ponds. Why so many stocked ponds? “Because we want to tell guests that in high water-which is what we’re in right now-they can still fly fish here,” Williams explains. Levels are way up on Brush Creek and the North Platte—too high for good angling right now. Learn more about the ranch with a Ranger Tour, a guided tour with a narration of Brush Creek Ranch’s storied history and its sustainable plan. Or tackle a mountain biking escapade—guided or solo—exploring a trail system and challenge course designed by endurance and adventure sport racer Mike Kloser. Details: Pricing is all-inclusive (per unit, not per person), so a cabin costs x amount, for however many are in your cabin (to its stated maximum). All food and beverage (including premium beer, wines, and spirits), all dining and activities on ranch are included; gratuities are a simple 10 percent service fee added upon checkout. Owners Bob and Karen Foster have stayed true to Disney’s advice, which is why Lost Valley remains such a wonderful place for families. Children’s programs range from supervised crafts, nature walks, and storytelling for the younger ones to riding, river tubing and dances for the teens. But while they love the kiddies here, there’s also a ttime set aside for adults only. Several times, in fact. Coming up: Fall Cattle Week Round Up: Sept. 25 – Oct. 2. Fall Colors Week Sept. 18–25. Horsemanship Weeks Ride Ride Ride: Sept. 18–25. Wegener: Sept. 11–18. Krause: Oct. 9–16. Check the ranch’s brochure for details on these special weeks. And if your corporate or company group wants a really memorable meeting getaway, consider getting lost–at Lost Valley Ranch. Lost Valley Ranch offers a variety of special rates to groups during Spring and Fall. Rates are based upon number in your party (up to 65 members), length of stay, arrival date, number/type of accommodations required and special services/activities you may require. While the ranch celebrates tradition, it hasn’t let technology pass it by. Check out the photo gallery on their website or take a peek at their live webcam. Details: Season is March through November. Spring (March 1 – May 22, 2011) and Fall (September 3- November 28, 2010), minimum stay is two nights. Summer (May 27 – August 28, 2011), minimum stay is seven nights, from Sunday to the following Sunday. Located near Deckers, the ranch is some two hours from Denver or Colorado Springs. When you pick your guest ranch and book your vacation, you’ll find that a lot of key information is right there on the website (either on Ranchweb or the ranchs’ own site). But every ranch is different, so make a quick call to your chosen ranch so you can brush up on some particulars before you go. Here are some of the details you should ask about. –If you just gotta stay connected, ask about cell phone and internet service; both are possible at more and more ranches, but be sure to confirm it. -Scope out out how many kids of your own children’s ages will be there during your visit; the answer may determine whether your child will need to bring that Gameboy or not. -Find out what is included in the rate. Typically, rates are all-inclusive, covering meals, horseback riding, all facilities, children’s and teen supervision, special programming. But sometimes extra options—spa treatments, trap shooting or fly fishing school—are extra. -Check what activities beside riding, hiking, and fishing you need special clothes or shoes for. You may want to add a skirt or your dancin’ shoes for that square dancing evening. -Clarify check- out and check-in times—they’re different from most hotels. Often, you’re okay to check in at 2 PM and asked to check out by 10 AM (exceptions are made individually). -Find out if the ranch has a liquor license and, if not, what their policy is about guests bringing their own bottles. Some ranches will let you bring your own bottles but ask you not to consume it in the public areas, in order to preserve a family atmosphere. Check ahead. -Medical needs are an issue for some guests. Ask if their staff is Red Cross First Aid certified and where the nearest hospital emergency room is located and how long it takes to reach. If your family members have serious medical issues, you may want to select a ranch that’s fairly handy to a major city. -If you’re a smoker, be sure to ask about the ranch’s smoking policy. In Colorado, for example, a new law restricts smoking in public places so you’ll be asked to step outside before you light up. Many ranch cabins are non-smoking now, as well. -Don’t assume Fido will be welcome. Ask what the ranch policy is first. Many ranches prohibit pets, as their safety may be at risk (among the cattle, herd of horses, and ranch dogs). We thank our friends at the Lost Valley Ranch for their help in compiling this list. Thanks for the update, Steph! “Someone might get hurt doing that.” “Doesn’t interest me.” “Too expensive.” “A week would be too long.” Over the years I mentioned to my friends and family I wanted to go to a dude ranch. I got plenty of looks and responses like the ones above. Then I became reacquainted with a friend at a high school reunion and I mentioned I wanted to go to a dude ranch but no one, even family, ever wanted to go with me! Her face lit up and she said she would love to go to a dude ranch and we should plan it! She even pushed me along to make it a reality. Hooray! This trip might be possible now I thought. I got to work. I loved Colorado, so I had the state picked and I knew I wanted something within a few hours of a major airport. I located dude ranches from web sites, visited their sites, and I called some of them. From them I gathered lots of information and a woman I spoke with encouraged me there were lots of good choices; I just needed to search for what I wanted. In my search I learned the people in the industry love what they do and offer. I sought out ranches based on experience (hotel vs. ranch), location (remote or nearby a city), and connection with those I spoke with, and price. I made a list of those ranches that offered what I desired and narrowed them down to four ranches. I then surveyed these ranches more carefully–making a spreadsheet for comparison and mulling over the options for some time. I spoke with my friend often about my finds and she kept saying what she wanted in the experience or what we couldn’t miss out on, so that drove my search. In the end it was personal contact, however, that sealed the deal after getting the 3 R’s of ranching—price, place, and prescription. A business that treats me like a good friend or attempts to value my thoughts while making me feel welcome has a good chance of securing my trust! After thinking about the choice over the months, a Rocky Mountain ranch won the vote of approval. Reflection tells me it was a great choice and my friend would agree. I savor the memories, the moments, and the mountains still…almost daily. I am so glad I didn’t let other’s negative or uniformed comments derail my quest to experience a dude ranch. While I was at the ranch I kept thinking of my family and how I wished they were a part of my experience. This was something we should have shared. You really can get close to people, nature, and enjoy some of the best things about life on a dude ranch vacation! A dude ranch vacation is different, so unlike most vacations. Maybe it’s the camaraderie and closeness you feel with others sharing a meal or maybe it’s the removal from the everyday hustle of life and the beauty of the out of doors. I am still not exactly sure why, but all I know is a dude ranch vacation may be one of the best ways to share life with those you care about while at the same time renewing your spirit. Editor’s note: Carolyn Flinn McCool is a freelance writer with twin sons. Making new memories and sharing something special is one of her favorite ways to experience life. Remember, you’re going to a guest ranch, so casual dress is in style at all times. Comfortable clothes and casual shoes or boots work best; you’re there for adventure and activity, so several changes of clothes are desirable. If its an upscale resort ranch, then you’ll want some nicer clothes for evening (cruise casual describes it best). For more details, be sure and check with your selected ranch. Going to the mountains: The weather can change quickly: temperature can range from the 80’s during the day to the 40’s at night. Bring a light jacket, sweater or sweatshirt to wear in the evenings and for layering; occasional passing showers means you’ll want a waterproof jacket with a hood. To the desert: Protect yourself (and the kids) from over-exposure to the sun, so you don’t “lose” a day to sunburn. Cover that tank top with a light, long-sleeved shirt; wear long, lightweight pants for riding, shorts for hanging out, and carry a sweater for the evening. Oh, and for any climate: a hat with a ‘stampede string’ that knots at the neck, so you won’t lose it on a ride. Boots: You must have riding boots for horseback riding. It just isn’t safe to ride in sneakers or hiking boots—your foot could slip through the stirrup or get stuck in it. But if you don’t have any, don’t feel that you must buy new ones; some ranches have spare pairs of kids and adults’ boots for you to borrow while at the ranch—be sure to ask ahead. Riding helmets: most ranches recommend wearing a helmet while riding, especially for kids. If you own a riding helmet fitted for you, you bring it, but most ranches have a supply of helmets available for your use. Toiletries: Yep, you’re gonna need bug spray, sunblock, toothpaste, etc. Some ranches have little ranch stores with some of those items, but don’t rely on it unless you ask. Extra activities: for hiking, use a pullover made of synthetic, wicking material (in the mountains, the weather can change quickly and the synthetic fabrics like fleece, and Coolmax will keep you warm and dry better than cotton). For fishing, ask what the ranch loans out; often waders, boots, rods and reels are all there for you. Nice extras: slippers–it’s kind of nice to have some slippers when you’re cruising around the cabins. Laundry: Ask about laundry services; some have self-serve facilities, others do it for you (yea!) with a 24-hour turnaround. Pre-trip, wash the jeans with fabric softener so the kids (and you) can avoid saddle sores from the rubbing of a thick, stiff jeans seam. Most ranches have washing machine/dryers available but if you don’t want to spend vacation time doing laundry, bring extra jeans, socks and tee-shirts for all. Bring that great book you’ve been wanting to catch up on because you’ll actually have the time to read while the kids are having fun. Bring some Advil/ ibuprofen because ‘some guys aren’t able resist trying out everything there is to do and, being a guy, he won’t hold back and will be super sore!’ says Stephanie of Vista Verde. Our thanks to Stephanie at Colorado’s Vista Verde Ranch, who sent us some great ideas for this list. And she offers one other suggestion: “With airline travel what it is these days, you could well arrive at the ranch before your luggage. While it invariably arrives within 24 hours, you could nevertheless have an uncomfortable first day. Accordingly, we suggest you pack some overnight items or a change of apparel in a carry-on.” Good idea, Steph! Editor’s note: This is part one of a two-park series, since packing for children/toddlers takes a whole different list. Stay tuned for: Packing with kids in mind. It sounds so simple to find, yet it can be more elusive than you think—even on some vacations. Well, quality time with the kids is all about balance. You want to be together—except when you want alone time, adult time, or just-kids time. It’s hard to find a vacation that makes all of that possible, until you think about a dude ranch. How do you make sure you choose a ranch that will foster family time? Pick a ranch that caters to families with kids, and with select “youth activity leaders” designed to guide children into fun activities; then, you don’t even have to think twice about what the kids are up to all day. Or you can be with ‘em every minute: it’s up to you how you schedule things. Either way, the end result is a happy child, relaxed parents, and good times spent together. At California‘s Rankin Ranch, the counselors prepare activities daily, ranging from riding and nature walks, to treasure hunts, talent shows, and toy boat building to learning about the area’s Piute Indians (and making Indian crafts). In any spare time, most kids enjoy feeding the calves and chickens skittering about on Sarah’s Farm area. Don’t forget to think outside the box—or even outside the West. At New York’s Rocking Horse Dude Ranch Resort, there’s an outstanding children’s program and day camp (optional babysitting nursery available), plus a giant Fort Wilderness playground and pony rides. So look for a ranch where they hand pick all their potential staffers, as Foster does, and then ask detailed questions about the kids’ programs. And don’t forget to ask your own children what they want in a ranch vacation. Oh, and, it’s okay to tell the kids what you’re looking for out of this vacation. After all, it’s okay for “the ‘rents” to have fun, too. Seeing your children react to a new setting—with animals, in the outdoors— is bound to bring out a whole different side to them. And letting them see you —relaxed, happy, away from daily routines, and not in ‘parent mode” for a change—can only help your relationship. Sitting next to your kids by a campfire at night singing songs, riding with them on the trail, or just gathering over chow at the end of a happy day; now that’s quality family time. Editor’s note: This is Part 2 of a 5-part series running on consecutive Mondays: Americans need a dude ranch vacation NOW! With vacation dollars tight this year, it’s more important than ever to choose the right vacation style for you and your family. For some, the choice can come down to a sort of ‘cruising versus dude ranching’ faceoff. Each is a fun way to vacation (and frankly, we love cruising). So how do you decide on the best choice for you this year? How green: for some folks, a green or eco-friendly choice is important. When it comes to the energy-use of a mega-sized cruise ship as opposed to even one of the larger dude ranch resorts, it’s no comparison. Horse power (and the natural, earth-friendly practices that are a time-honored way of life at so many ranches) will always trump the energy use of a giant floating hotel. Family friendly fun: both cruise ship and dude ranch offer plenty. And if Broadway-style shows and dazzling nightlife are your thing, then maybe a cruise is your best bet. But if you’re looking for family togetherness, and a getaway that, frankly, excludes the more adult side of some cruise ships (especially those with casino gambling and grownups-only entertainment), then maybe the ranch is the place for you. Crowds and costs: of course, the mega-ships are built for crowds (that’s how they can bring down their ticket prices). But beware; once in port, those crowds can hold you up when you’re trying to get off the ship. At a dude ranch, finding peace and quiet and your own patch of sky are part of the package. And those low cruise ticket prices? Often, it means you pay extra for everything from soft drinks to on-board fun and shore excursions. At a dude ranch, all-inclusive really means just that. You won’t have to reach into your wallet ten times a day–it’s all covered. So, if you want to know exactly what your vacation will cost, choose a dude ranch. And all those other things that are included at the ranch? Getting away from crowds and shopping malls, finding peace and quiet and real family time: priceless. Stephanie at The Home Ranch, just outside of Steamboat Springs, Colorado, just emailed me that they’re extending their 2009 winter season. Guests can now book their trip through April 8, taking advantage of the abundant snow and many fun winter activities The Home Ranch offers. Winter guests enjoy everything from cross country and downhill skiing to snowshoeing (pictured), tubing, horseback riding and sleigh rides, and fly fishing and kids’ games. The Home Ranch also boasts some of the best food and wine around, with gourmet meals prepared by Chef Clyde Nelson. Accommodations include six rooms in the main lodge and eight private cabins ranging from one to three bedrooms; each of the cabins has its own hot tub on the porch. All activities and meals are included in the cost of the stay, and kids stay free at the Home Ranch. For more Colorado winter fun, check out Vista Verde Ranch; choose from a wide menu of many winter activities- backcountry skiing, cross country skiing, horseback riding, sleigh ride, sledding, snowshoeing, and more. And don’t miss the C Lazy U Ranch; new this year: a groomed tubing hill! Enjoy snowmobile-drawn tubing where you ride behind a snowmobile on an inflatable tube (daily for children and adults). Or take a shuttle up to the top of the C Lazy U driveway and sled all the way down the C Lazy U Luge to the ranch. Organized sledding begins daily from 3:00-4:00 (conditions permitting). It’s a fun-filled, snowy adventure! Welcome to Gene Kilgore's world of Dude and Guest Ranching. 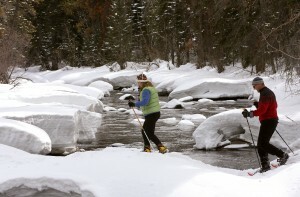 Planning a dude ranch vacation, fly fishing trip, or girls getaway? Then saddle up and ride with us! A leader in the world of ranching, Kilgore and award-winning writer Lora Finnegan share RANCH NEWS, TIPS FOR MOMS, FOOD AND WINE INFO, plus RANCHER PROFILES AND RANCH REVIEWS. 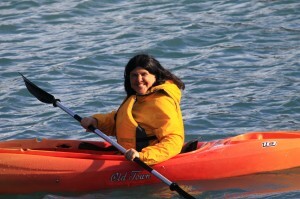 Lora is an award-winning writer and editor, formerly with Sunset Magazine and a member of the Society of American Travel Writers (SATW). She loves dude ranches, horses, and the great outdoors!